Hailing from Finland and featuring Amberian Dawn’s former drummer, there seems little difference between the two bands on first glance. Both are fronted by attractive redheads, both play slightly sugary power metal a la Nightwish back in the day, but not as good – you’re either onboard already or you’re not. Dotma do just about deserve your ears, however, vocalist Johanna having that sort of light lilt that made Tarja an icon, and the backing mixture of restrained symphonic keyboards and guitar-led metal working well if rarely resulting in anything memorable. Opener Legend Of Blackbird does the job best, flowing nicely and sliding around well enough so that the listener doesn’t care about the lack of direction. From then on, however, things are less good. Problems are rife throughout; to be honest, Dotma really needing to go back to the drawing board when it comes to songwriting. Guitar riffs tend to be used as backing filler rather than, well, guitar riffs, whilst the keyboards carry the melodic lines – a few solos such as in Silent Sunshine add a little interest and style where it’s badly lacking, but it’s not enough. Little touches like the male vocals in Reborn add little and seem out of place, in that case working against the band as it distracts the listener from an intriguingly buried melody. Indian Fall’s quiet prog-tinged acoustic ballad is one of the better tracks, being built on a strong base and playing to the band’s talents, but the following Whispering missteps quite dramatically by going from near-ambience at the start to sudden neoclassical shredding, down to poppy female lilt, up to goth metal riffs and melodrama – it’s quite schizophrenic, and not in a good way. It’s best when most typical, the power metal riffing led by Johanna’s voice very pleasant when just allowed to flow, but alas, the band can’t leave well alone. A quick bit of browsing reveals that ‘atmospheric’ and ‘soulful’ are apparently what Dotma want you to think of their music, and whilst some moments just about meet the latter, I’m struggling to apply the former without chuckling. The outrageously hammy male voice-acting on The Cave is just beyond terrible, Rhapsody Of Fire are up there with The Wire in comparison. Kingdom Of The Sky opens well, but at eleven minutes in length something is just begging to go wrong, and it’s about as drawn-out and dull as it’s possible to get. Following that with an eight-minute finale was a brave move, and despite some surprisingly enjoyably guitar widdling, you’re still rather glad when Memory Worth Dying For over. This isn’t a band that keeps you listening by careening off the rails, it’s a band that sticks all too boringly to them. 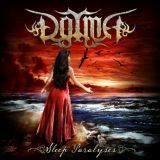 Again, I’m drawn back to Amberian Dawn as a comparison – their first album was poor, and they really got their act together for the follow-up, something I’m hoping that Dotma can copy. True, they’re not as ‘metal’ in approach, preferring goth melodrama and having a clear proggy/folky influence that they’d do well to explore. However, once they’ve sharpened the ol’ songwriting skills, we’ll see a decent band take shape. Until then, unless your lust for old Nightwish is so unbearable that you’ll end up hurting yourself without some inferior replacement, you can safely skip Dotma.